As Star Trek fans might say, it’s an A320, Jim, but not as we know it. 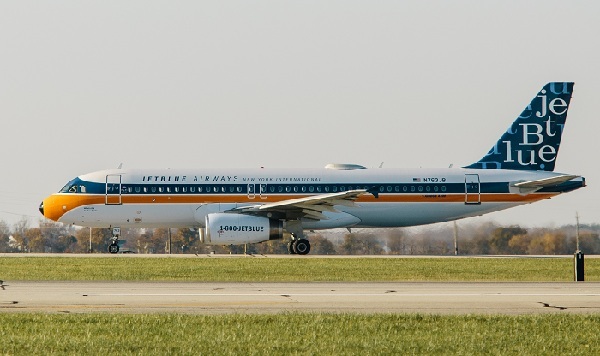 It’s a RetroJet, courtesy of JetBlue, introduced to launch a new seasonal service between Fort Lauderdale and Palm Springs. To create the look, JetBlue researched popular logos and airline companies from the mid-1960s to visualise what the carrier of today might have looked like some five decades ago. The design features JetBlue orange and blue “speed stripes”, a popular characteristic of the times. The name JetBlue Airways uses a font consistent with a typeface of the period. Most notable is the tail – no simple airline logo or icon, but a blaze of colour and a 1960s’ jazz-inspired font. The only problem is the that jet age began, as far as domestic flights in North America are concerned, with the Boeing 737, not the Airbus. And the British Viscount really won the race, but its Rolls-Royce jet engines turned propellers. Moving the gaolposts is something the US does not understand! Aah . . . BCAL?